It hadda happen. A fella says "You betcha der hey!" and thenext thiNg ya know, he's up on stage. Singin' & Dancin,' forkrups sake! Tellin' stories in front of people he don't evenknow. This charming comedic musical tells the story of two ice fishingbuddies from Northern Wisconsin who talk and sing about life,love, and the one that got away. The LST production is anewly-expanded version that adds three new songs and a 'half-timeshow' to the hilarious original. 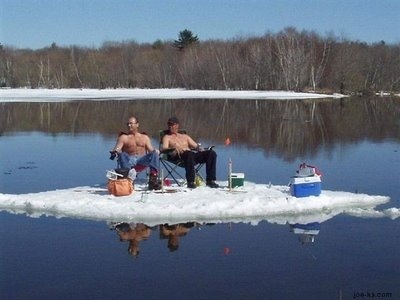 From their ice fishing shanty, long-time pals Lloyd and Marvinkeep warm with a mutual appreciation for good bait, cold beer, andthe Green Bay Packers. As Marvin anxiously awaits his opportunityto appear on a cable TV fishing show and share secrets of his lifeon da' lake, Lloyds ponders a recent squabble with his wifeconcerning plans to spend their anniversary at Lambeau Field. 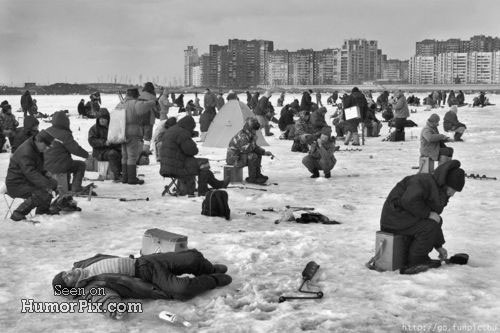 Bothpals scramble to protect their cold ones from fellow angler, Erniethe Moocher.With musical numbers like "De Wishing Hole", "Ode to a SnowmobileSuit", and "Fish is de Miracle Food", Guys on Ice will charm yourwool socks off. It is a story every yooper can relate to.... itis also surprisingly touching. If you enjoy the homespun humorof Garrison Keillor you will love this....Guys on Ice hasplayed to sold-out houses across the country and now LST brings ithome to the boathouse! You've seen them. 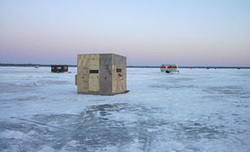 Little wooden shanties sitting on lake ice.Puffs of smoke rising from chimney pipes. On a quiet day, maybe the frozen tundra, back to shore. In a cold world, on a cold day,on a frozen lake, these little signs of life are all most people know of a secret culture that thrives right here amongst us. Well,wonder no more.